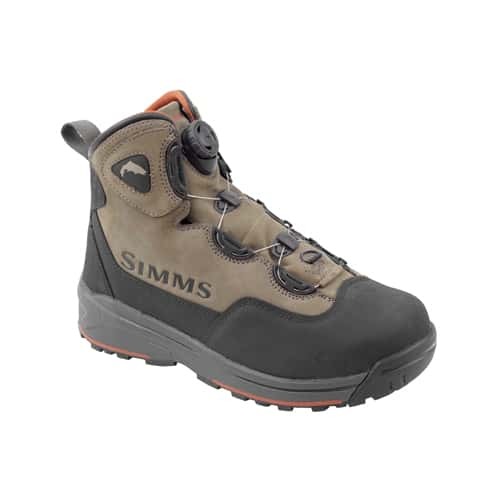 The Simms Headwaters Boa Vibram Sole Fly-Fishing Boot is a very innovative and feature-rich Simms fly-fishing boot that features a Vibram Idrogrip rubber outsole and and a dual density midsole for shock absorption. This fly-fishing boot also utilizes the ESS plates for improved cleat retention and proprioception. The Simms Headwaters Boa Vibram Sole Fly-Fishing Boot features a Boa closure system for a precise, fast on and off performance, on-demand fit that is extremely comfortable and is constructed with waterproof nubuck leather with a full scratch rubber rand. The Simms Headwaters Boa Vibram Sole Fly-Fishing Boot is a very innovative, comfortable, high quality fly-fishing boot that should definitely be worn during your next fly-fishing adventure, so make sure to check out this Simms Headwaters Boa Vibram Sole Fly-Fishing Boot today from the Platte River Fly Shop. Today, Simms Vibram soles are manufactured in Brazil, China, Italy and the United States, and are used by more than 1,000 footwear manufacturers in their footwear products. Vibram is well known for pioneering the barefoot running movement with the FiveFingers line of shoes that mimic the look and mechanics of being barefoot. In the United States, Simms Vibram soling products are manufactured under exclusive license by Quabaug Corporation of North Brookfield, Massachusetts. Although the brand is best known among the outdoor and mountaineering community, Vibram produces numerous models of soles specifically designed for fashion, military, rescue, law enforcement or industrial use. Vibram also produces soles used exclusively for footwear resoling. Vibram also produces a line of disc golf discs. They have released several putters and fairway drivers.